Pope Francis I was just elected. It is as if God just gave us the bishop from Les Miserables as pope. A member of the Society of Jesus, a man of deep prayer and a priest of profound concern for the poor. 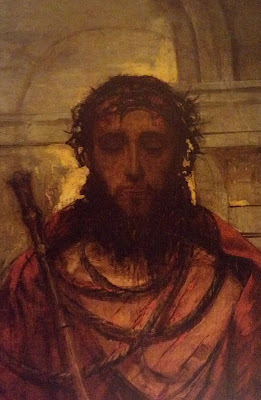 At the beginning of Lent, preaching on a text from the Prophet Joel, he made an impassioned plea to the clergy and religious of Argentina, "The Kingdom of God may need our hearts torn by the desire for conversion and for the love, the breaking forth of grace and the effective gesture to ease the pain of our brothers and sister who walk together with us." His message is poignant against indifference to sin and the social evils that choke out the life of prayer. No one can pray very deeply if they are callous to those God has entrusted to us, especially the most vulnerable. At the same time, this wound of sin is too deep to be addressed by merely external actions and gestures. Our hearts must be torn by the fact that we are not effectively protecting and loving the most vulnerable in our society. The love of God heals sin and wakes us up out of our spiritual slumber. This is the threshold to deep intimacy with Christ who is also concerned for the plight of the most vulnerable and identifies Himself with them. I have offered some further reflections over at Dan Burke's Roman Catholic Spiritual Direction blog. In the meantime, here is a report from a seminarian in Rome. The parable of the prodigal son from Luke 15:12ff stands out for those struggling in the life of prayer. As we read the story, we find ourselves putting ourselves in the place of the different characters, measuring our actions against theirs: the merciful father, the prodigal son, the elder son, even the servants. I also love to think about the father's house and how it serves as a fitting image for the ultimate end of the divine economy, the fundamental purpose of our creation and salvation: that joyful communion of love, of perfect unity with one another in the bosom of the Holy Trinity. Jesus tells this parable on his way to Jerusalem from Galilee. He too is going to His Father's House, the Temple where he was presented as a child and where he was found at the threshold of his teenage years. He knows the Father of Mercy. In the mystery of such exceeding love, how could His heart not be broken over the plight of His sons and daughters? Where there was no hope, the Father sent His Son to be hope. Christ, like the prodigal son, lost everything He had - except not in disobedience but obedience, not on destitute living but rather out of love for the destitute. Spiritual poverty, misery, suffering- this is the horizon of our humanity that God has chosen to share with us. Like a servant, a suffering servant, accomplishing the Father's will with signs and wonders, the Son liberates those He encounters along the way. He wants to help them come to their senses so that He might free them from serving the pigsty in which they are trapped. This redemption is won at great price. Like the Merciful Father, the Image of the invisible God is misunderstood, rejected, threatened, betrayed and denied by those He most relies on. It is by passing through this misery that the Word made flesh enters into the heart of humanity, the Father's House where the Chosen People worshipped God in the shadow of history - where we too can begin to worship Him now in mystery. When we listen to the parable of the prodigal son, it is important to remember that Christ Himself is telling us this story. The Word of the Father journeys through our hearts just as He journeyed through the misery of Galilee and Judah. Everything He says and does has inexhaustible meaning in relation to His destination, the Father's house to which He leads us. When He tells us the prodigal son came to senses, this means something for our life of prayer. To hear the voice of the Father's Word in our hearts compels us to deny our false judgments about life and to make a new judgment about the Father: this is to come to our senses. It is a moment of humility, a moment of trust, and a moment of compunction. It is the moment in which the Father finds us. If, in our righteous indignation, we play the elder brother and refuse this moment, how will we enter the Father's House? Embracing this moment with gratitude and allowing oneself to be embraced by the Father: this is what it means to begin to pray. There are stories about great saints who struggled to pray in the face of great difficulty. This can be baffling until we try to enter into the Passion of Christ and consider the movements of His Heart before the merciful love of the Father. Until we contemplate the prayer of the Word of the Father, this struggle to pray is often deemed to be merely a stage through which we pass. Yet, in the Garden of Gethsemane (see Luke 22:35ff), the bloody sweat of the Son of God reveals this struggle as a supreme moment of Christian contemplation, a terrifying standard against which the truth of all our other prayers can be discerned. The hymn of praise learned with the Suffering Servant on the Mount of Olives is shrouded in a mystery. It is against this mystery that therapeutic approaches to prayer should be discerned. Psychological or physical tantrums are silenced before the authentic cry of heart offered by the Son of Man. His love for his disciples and devotion to the Father challenges any consumerist attitude toward the things of God. His sorrow and spiritual poverty helps us feel the appropriate shame we ought to have over any gluttonous expectation for mental relief or euphoric experience. Against the dark terror Jesus confronts in prayer, spiritual consumerism can only be seen as limiting the freedom that our conversation with the Lord requires. The Word made flesh baptized every moment of his earthly life in this kind of prayer. Every heart beat and every breath was so filled with zeal for the Father and those the Father gave Him, divine love ever exploded in His sacred humanity with resounding silence, astonishing signs, heart-aching wonders and words of wisdom which even after two thousand years still give the world pause. Each verse of the Gospels attempts to show us His self-emptying divinity boldly hurling His prayerful humanity with the invincible force of love to the Cross. In Gethsemane we glimpse how the Son of Man availed Himself to these mysterious promptings of the Father's love, an unfathomable love that is not comfortable to our limited humanity. Unaided human reason cannot penetrate the divine passion that compelled Him into the solitude hidden mountains and secret gardens. His vigil on the Mount of Olives can only be understood as the culmination of the ongoing conversation to which He eagerly made His humanity vulnerable. If, in this culminating movement of heart, Christ sweat blood, we who have decided to follow in the footsteps of our Crucified Master should not be surprised by moments of great anguish in our own conversation with God. In the face of this mystery, we must allow the Risen Lord to give us His courage. What is revealed on the Mount of Olives helps us see why Christian prayer can mature into a beautiful surrender, a movement of love which gives glory to the Father and extends the redemptive work of the Redeemer in the world. What Christian contemplation sees with the Son of God can involve very difficult struggle, through the strength that comes from the Savior even the terrifying moments of such prayer can resolve themselves in trustful surrender: "Not my will... Yours be done." A vision of prayer that contemplates in the midst of terror and anguish is probably not a popular subject, but I think a very important one today. For further reflection on this I refer you to "Blessings that are Difficult to Receive" on Dan Burke's Roman Catholic Spiritual Direction blog.